What Makes a Meter a Max Precision Flow Meter? When it comes to low flows or intermittent flows, there’s no replacement for positive displacement meters. Coriolis, ultrasonic, thermal mass, and magnetic meters have their places when flow is relatively consistent without abrupt flow profile changes. Do you need 1,000:1 turn down? Bi-Directional flow control? Fuel injector testing? Valve leak testing? When you do have need for instantaneous flow profile data and control, use the highest resolution, fastest reacting positive displacement liquid flow meter, a Max Precision Flow Meter. Max Precision Flow Meters offer capabilities that are unique to positive displacement meters with the additional benefits of higher accuracy and higher resolution that no other meter manufacturer can do. Why would I choose a Max flow meter for my application? We measure your difficult applications when other meters will not meet your needs. No straight piping requirements – laminar flow is not needed. What kind of Service and Support do you provide? We provide technical consultation for the lifetime of your Max flow meter. We are committed to providing you, our customers, with the information needed for a successful and easy installation. All you have to do is Contact Us. Our manufactured products are covered under our standard manufacturer’s Warranty. Calibrations and refurbishment of our flow meters are available on an as quoted basis. Submit the Service Request form for price and lead time. What is the Price of a Max Precision Flow Meter? The price of a Max Precision Flow Meter is determined by your application needs. (You wouldn’t cross shop a measuring tape with a micrometer. They are meant for different jobs. A Max meter, needs to be selected for your application needs first.) Flow range, accuracy needed, type of signal output, and need for hazardous location protection all are incorporated into determining why you will be buying a Max meter. We provide a value with our measurement capabilities that is unsurpassed when you have a need for measurement where you cannot measure another way. For specific model pricing, contact us with the information requested on the Request for Quotation. What is a typical product lifespan for a Max meter? We design and manufacture our flow meters to last a long time in industrial environments. The easier the application, the longer the meter will last. The harsher the application, the more often you may need to replace equipment. On average, single use customers order from us approximately every 5-7 years and we have many meters operating for 20 years or more in various applications. We calibrate meters no matter how old they are. Our refurbishment program ends with meters that are 10 years old and older. The 10 year refurbishment span is based on the fact that the metering technology has changed greatly in that time. 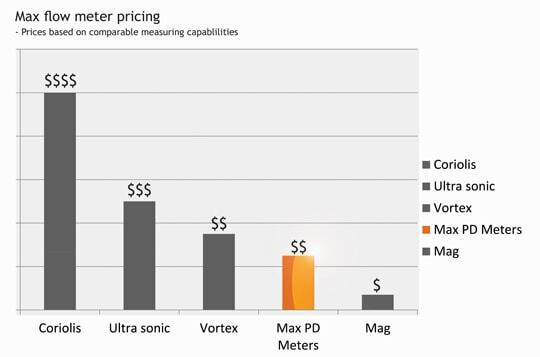 While a new Max meter may look like a Max meter from 35 years ago on the outside, advances in metallurgy, breakthroughs in coatings, and improvements in electronics technology make the latest Max meters a superior product to those sold last decade. What are some of the most common applications of MAX flow meters? Positive displacement meters, including Max meters, thrive in low flow, intermittent flow, and variable viscosity markets.